While many surgeons may market "minimally invasive surgery" in an effort to attract patients, unfortunately the patient may end up with a traditional, open spine surgery. Minimally invasive spine surgery is more difficult for the physician because it involves a great deal of training to become proficient. Large centers that perform a high volume of spine surgeries may opt for the open procedure so that residents and fellows can be involved. Dr. Valentino at Liberty Spine Care is at the forefront of minimally invasive surgical treatment. 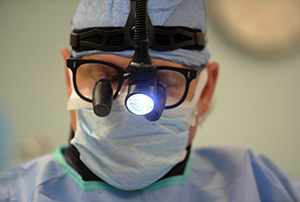 When surgery is necessary and if a patient is a candidate for a minimally invasive procedure, Dr. Valentino prefers to use a minimally invasive technique for patient benefit. 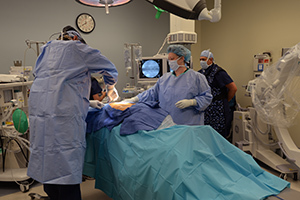 Unlike traditional spine surgery, which is done by creating a long incision to allow a surgeon to view and access the anatomy of the body, minimally invasive spine surgery does not require a long incision. Minimally invasive spine surgery, or MISS, is an endoscopic procedure that uses specialized video cameras and instruments that allows a physician to make a small incision that significantly reduces the amount of damage to the muscle and surrounding areas. The result is less pain after surgery and a faster recovery. 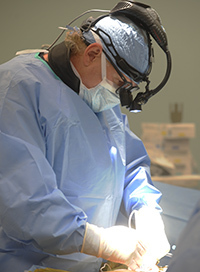 Minimally invasive surgery was previously only used for common procedures like decompression and spinal fusion but techniques are now being used for other spine procedures. What makes minimally invasive spine surgery uniquely different from traditional surgery is that physicians use specialized instruments to access the spine instead of making a 5-6 inch incision and interrupting muscles in order to see the spine. This pulling, or retraction, of the muscles can damage the soft tissue and typically affects more anatomy than the surgeon requires. This increases the risk for muscle injuries and can lead to a much longer recovery time. Minimally invasive techniques were developed to reduce these risks. By providing a patient with smaller incisions, less bleeding and less pain it reduces a patients’ stay in the hospital and allows for a faster recovery time. This form of surgery is proving to be particularly successful in joint replacement for arthritis as well as reconstruction of fractures and bones and realignment of extremities. In addition, these new techniques allow indirect fracture reduction and fixation with less likelihood of injury to blood flow to vital structures and less harm to blood vessels and nerves. It is important to note that the technology used to perform minimally invasive orthopedic procedures has undergone significant advances in recent years and Liberty Spine Care is continuing to improve and refine ways to make surgeries even less invasive. The surgeon starts the procedure by determining where to place the incision through the use of a fluoroscope. Fluoroscopy is an imaging technique that uses X-rays to obtain images in real-time of the internal structures of a patient, such as the spine. The surgeon may then use an operating microscope to magnify the view of the damaged area after a special tool called a tubular retractor is inserted. A tubular retractor is a tool used to create a passageway for the surgeon to reach the problem. It is inserted through the skin and soft tissues down to the spinal column that creates a tunnel to the area where the problem is located. The tubular retractor holds the muscles open and in place. The surgeon then uses small instruments that fit into the tubular retractor to either remove any bone or disk material or insert any devices necessary for fusion like screws or rods. Once the procedure is finished, the tubular retractor is removed and the muscles are able to return to their original position, which limits the amount of muscle damage. Liberty Spine Care uses state of the art minimally invasive techniques and instrumentation to help patients recover in a shorter period of time and allow for a quicker return home. 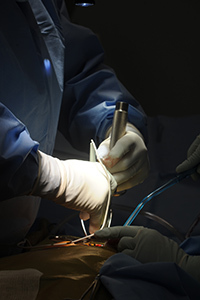 Innovative developments in minimally invasive techniques have pioneered better ways for the surgeon to access the spine, moreover making the recovery process more seamless. In minimally invasive spine surgery, a smaller incision is made, sometimes only a half-inch in length. The surgeon inserts special surgical instruments through these tiny incisions to access the damaged disc in the spine. Entry and repair to the damaged disc or vertebrae is achieved without harming nearby muscles and tissues when using minimally invasive techniques. Minimally invasive spine surgery requires extensive training and experience to master use of the tools, but there is tremendous benefit for the patient. Unlike many other spine care providers, the spine patients who undergo minimally invasive surgery at Liberty Spine Care can often have their surgery on an outpatient basis and be home later the same day. Recovery in one’s own home can be more comfortable than staying in a hospital bed. As with any medical procedure there are always risks involved. These risks can be classified as either general or procedure-specific risks. With the introduction of minimal access spinal technologies (MAST), spine surgeons can make a smaller incision, while at the same time accomplish identical results as open spine surgery. Due to the acute accuracy provided by these tools, surgeons can access the vertebrae through the narrow probes with surgical cameras and tools. A minimally invasive lumbar discectomy is when a herniated disc is removed in the lower back that pinches a nerve that may cause severe leg pain, numbness, or weakness. This procedure is done by making a small 1-inch incision over the herniated disk and inserting a tubular retractor. Then the surgeon removes a small amount of the lamina bone that allows the surgeon to view the spinal nerve and disk. Once the surgeon can view the spinal nerve and disk, the surgeon will retract the nerve, remove the damaged disk, and replaces it with bone graft material. A minimally posterior cervical discectomy is when a herniated disc is removed in the back of the neck that pinches a nerve that may cause severe leg pain, numbness, or weakness. This procedure is done by making a small 1-inch incision over the herniated disk and inserting a tubular retractor. Then the surgeon removes a small amount of the lamina bone that allows the surgeon to view the spinal nerve and disk. Once the surgeon can view the spinal nerve and disk, the surgeon will retract the nerve, remove the damaged disk, and replaces it with bone graft material. A minimally invasive lumbar fusion can be performed the same way as traditional open lumbar fusion, either from the back, through the abdomen, or from the side. A common minimally invasive procedure is called the TLIF. This procedure is done by approaching the spine slightly from the side, which reduces the distance spinal nerves must be moved and prevents disruption of the midline ligaments and bone. However, this does not provide the surgeon with a full view and is often more challenging to remove the disk completely, which can make fusion healing more difficult. As a result, a surgeon may use additional bone graft besides the patient’s bone to improve healing. The surgeon may complete this procedure by placing one retractor on either side of spine. By using two retractors, the surgeon can remove the lamina and the disk, place the bone graft into place, and insert screws or rods for additional support. 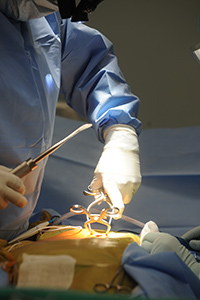 A complex minimally invasive surgery with lateral approach is a minimally invasive technique that is performed on the side of the body, which is less invasive as compared to traditional surgery. This procedure can be used to help treat various conditions such as degenerative disc disease, herniated discs, spinal instabilities, osteomyelitis and spondylolysis. A LIF is performed by removing a disc and replacing it with a spacer that will fuse with the surrounding vertebra. The procedure is completed on the side of the body in order to reduce the effect on the nerves and muscle of the back. A percutaneous posterior pedicle screw fixation is when metal rods are attached along a vertebra to help stabilize the spine. An endoscopic discectomy is performed by making a tiny incision to insert a tiny camera, or endoscope, to remove part of a herniated disc that is applying pressure on spinal nerves. A PCMF is performed to help relieve pressure and discomfort in the spine by making a small incision in the back of the neck and removing excess scar tissue and bone graft material. An anterior cervical discectomy is used to reduce pressure or discomfort in the neck by removing a herniated disc through a small incision in the front of the neck. The space is then filled with bone graft material and plates or screws may be used to increase stability. A TDR occurs when most or all of a disc is removed and replaced with a artificial one. An ALIF is a procedure done to remove a disc through an incision in the front of the body through the abdomen. The disc is removed and replaced with a spacer that contains bone graft material that will fuse with the surrounding vertebra. A Mini ALIF is the same as a standard ALIF, but is done through a smaller incision in the front of the body to remove the disc and replace the disc with a spacer that will fuse with surrounding vertebra to increase spinal stability. A Laminectomy is a procedure done to help decrease spinal pressure by removing all of the lamina, which is the thin bony layer that covers the top of the spinal cord. A Laminotomy is a procedure done to help decrease spinal pressure by removing part of the thin bony layer that covers the top of the spinal cord called the lamina. 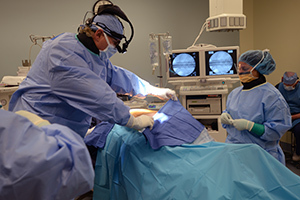 Oftentimes, bone is harvested from the hip of a patient during traditional fusion procedures. Unfortunately, this process may cause additional pain and discomfort. BMP, also known as “bone morphogenetic protein”, is a new bone-growth substance that eliminates the need for cutting bone from a person’s hip. Trace protein extracts are found in bones and are required for the bone to heal or regenerate. A sufficient amount of the protein must be available in order to begin bone formation. Scientists have developed a usable form of BMP that is now being used in place of bone harvested from a patient’s hip. This bone graft is made from pure bone protein (minerals and collagen) and absorbable collagen sponge that promotes new bone formation. Studies show that the positive results achieved from surgery using BMP equal that of an autograft procedure (in which bone is taken from the hip).